You feel you are in a James Bond movie. You enter the cavernous underground vault of the Central Bank of the Islamic Republic of Iran, and there, laid out in 37 bulletproof glass vitrines, is the most jaw-dropping—and most fabled—collection of jewellery, loose stones (think 100-carat diamonds) and gem-studded objects (think Nadir Shah’s shield, the one he used to conquer India) winking at you. Whereas Bond might have pulled off some heroic feat in a few graceful moves—dodging imaginary lasers, a Persian lovely or two in attendance—you just stand there and gawp. This is the treasure to beat all treasures. The Treasury of National Jewels, as it is officially known, has it all. Enormous gemstones in enormous quantities; so much so that you lose your sense of proportion, and catch yourself referring to a 60-carat rare pink diamond as “small” just because it might have a larger 182-carat sibling (more on these two lovelies later). There is a profusion of dazzlingly beautiful jewellery, especially the crowns and tiaras, and you think wistfully what it would be like to try one, even for a split second. 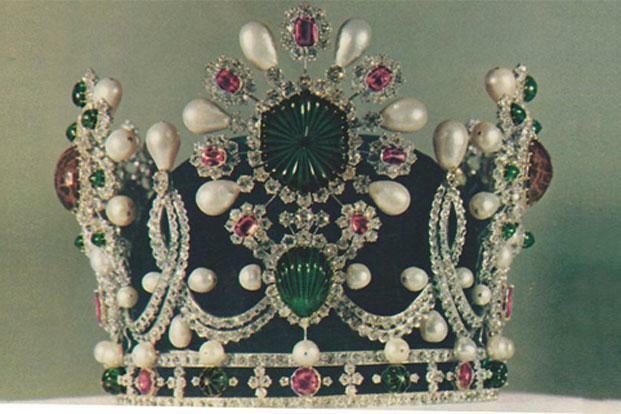 There is whimsical inventiveness; for example, a 34-kilo Globe of Jewels, with the oceans marked in emeralds, and the countries in rubies, using up 51,366 stones in the process. There is over-the-top taken to new lengths, quite literally in the case of the Peacock throne (not to be mistaken with the one pinched from India in 1739), which is long enough for a king to sleep in, though perhaps not so comfortably, given that it is copiously encrusted with precious stones. But it is finally the history—the stories of great love and awful war—that imbues these jewels with a magical quality. You look at an unset Burmese ruby of 100 carats, drop-dead gorgeous, claimed to be the largest in the world, and you go, oh wow, this one is a beauty. And then you look at empress Farah’s crown—the most divine piece of jewellery in the treasury, my favourite—and you don’t just see the stones, massive as they are, you also feel her presence, her elegance, her sense of style. You imagine the splendour of the 1967 coronation ceremony, you wonder what it must feel like to become the first, and only, Shahbanou of Iran, giving her the right to rule in case the Shah died and his heir had not come of age. The story of the making of empress Farah’s crown by Van Cleef and Arpels is equally fascinating. While the Shah himself reused the Pahlavi crown made for his father’s coronation in 1926—it is another knockout piece, with 3,380 diamonds totting up to 1,144 carats, the central stone a 60-carat yellow diamond from which the rays of the sun fan out— Farah would be the first empress. A new crown was needed. From the thousands upon thousands of loose stones in the Iranian treasury, the jeweller Pierre Arpels personally selected the gems he wanted, the centrepiece a spectacular 150-carat hexagonal emerald, engraved with lines, and a matching shell-shaped emerald below it. The hitch? He couldn’t take the gems to Paris—Iranian law prohibited them from leaving even the treasury premises—so he ended up setting a jewellery workshop right there inside the treasury! It was well worth the effort, as soon a stream of royal family orders flowed his way. He not only completed the crown, he also made matching earrings and a necklace for empress Farah, and tiara-necklace-earring sets for the Shah’s sisters and daughters. * * * India plays a major, though bittersweet, role in the most celebrated jewels here. Without doubt, the Darya-e-Noor, or Sea of Light, is the star of the show, not only because it is such a rare stone; pale pink rectangle, 4cm long, 3cm wide, weighing a whopping 182 carats, but also because it encapsulates centuries of daredevil history. When Nadir Shah plundered India in 1739, he pinched the Darya-e-Noor from the Mughals. Turns out, the French traveller Jean-Baptiste Tavernier had written about this diamond a century earlier, in fact he had tried to buy it in Golconda, in vain, but here’s the twist: The stone was 246 carats at that time. Somewhere along the way— from Golconda to the Mughal treasury to Nadir Shah’s pocket to the Iranian treasury—the stone was cut in two, the bigger one being the Darya-e-Noor, and the “smaller” 60-carat piece christened the Noor-Al-Ain, or Light of the Eye. The Noor-Al-Ain is here too, happily occupying centre stage in a tiara designed by Harry Winston, with 324 other diamonds for company. While the two pieces of the fractured pink diamond sit in their respective vitrines, there is a final twist to the Darya-e-Noor tale. From Nadir Shah, the diamond “passed” to successive dynasties, finally ending up with the Qajar king Nasser-ed-din Shah, who was extremely fond of it and wore it as an aigrette. The reason for his fondness throws you back a couple of millennia: He believed the Darya-e-Noor once sat on the crown of Cyrus, who ruled from 558-529 BC. You want to say fat chance, but then you think if there can be a diamond so big, then why can’t it have a big story to match? Ironically, the most fascinating story is about the diamond that got away, the magnificent Kohinoor, 186 carats, finest white colour. Nadir Shah had got this one too from his India heist. Apparently, he was so blinded by its dazzle that he exclaimed “Koh-i-noor”, meaning “mountain of light”, and the name stuck. The diamond, however, changed hands several times without a single cent ever paid. The Afghans captured it from the Iranians, the maharaja of Punjab Ranjit Singh captured it from the Afghans, the East India Company pried it from his young heir’s hands, and “presented” it to queen Victoria. Fat chance is right, but one thing is for sure: Pinching and bullying is part of the Kohinoor’s history, as indeed the history of all remarkable jewels.